We're yet to see an attractive networking box. The main benefit of this Belkin model is increased wireless range, so you can use devices further away from your wireless access point, for example. The G MIMO is not as good as the latest Draft-N kits hitting the market now but provides you with much of that power at a better price point. 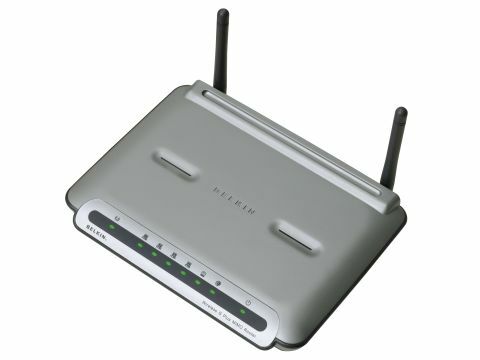 Higher-end MIMO (Multiple Input, Multiple Output) models - such as the other Belkin router we've reviewed here - are designed to have better throughput as well as that allimportant boosted range. After all, for most home uses it's unlikely that you'll need much throughput, for the simple reason that sharing an internet connection isn't that testing for any router. The increased range capabilities this router gives are quite compelling, and you can get better reception out of any wireless device, even though it can't have Belkin's proprietary wireless card plugged into it - that's PC-only for the moment. The G MIMO does have a rather aged look, though; this router chassis has been used by Belkin for some time now. And, with other manufacturers coming out with better-looking models, we're sure it'll only be a matter of time before Belkin does the same.